This is traditional Irish music. We have been able to broaden our "style" since, between the six musicians of Smitty's Kitchen, we had 11 instruments to use....And we did use them all at various times. We were able to swing a little to the "left and right", adding some classical sounds, some jazz-type sounds, and a tune with a middle eastern sound. This music basically is kitchen music, played/recorded in the farmhouse of Cynthia and Stephen Smith on July 24, 2010. 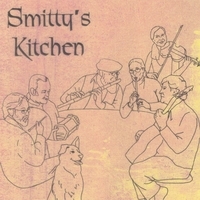 You can visit Smitty's Kitchen on Facebook.